This elegant silver plated "trompe l'oeil" wine cooler was crafted in England, circa 1880. The bucket has a realistic basket weave texture throughout, and both handles are shaped as vines and embellished with grape and leaf decor. 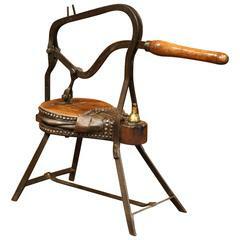 The wine or champagne bottle holder is signed on the bottom George Richmond Collins, with various stamps. The cooler is in excellent condition with a rich patinated metallic finish. 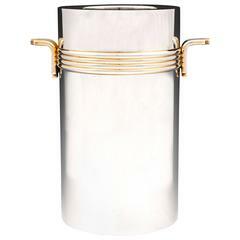 This bucket would make a sophisticated addition to a wet bar or kitchen counter while entertaining guests. 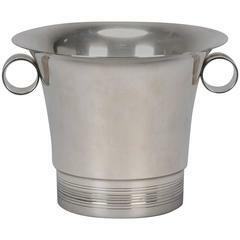 Measures: 11" W x 8" D x 8" H.
Silver plate wine cooler/ice bucket found in Italy, unknown origin, circa 1950s. Classic lines with subtle flared lip, looped handles and ridged design at base. 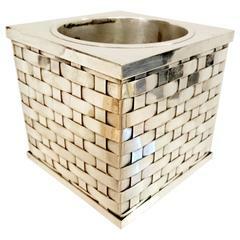 Glam and bottle holder / ice bucket in basket weave technique in silver plated metal. Original label from the store left on the bottom. It's a Sheffield plate wine cooler in the style of Matthew Boulton, the signs of age create an amazing antique look. Owner crest in the front and a W on the bottom.